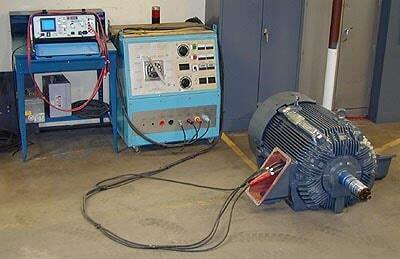 As a repair shop, Electric Motor Company Inc. adheres to the highest standards available to the industry. Equipment brought in for repair is disassembled and inspected for both mechanical and electrical defects. The test results are recorded on job cards and stored for future reference. Stators that are to be rewound are “burned out” in a Bayco temperature controlled, pollution free oven. Winding data is taken and recorded. The stators are then cleaned, dried, and insulated using Class H, NOMEX insulation. Coils are made using 200° C copper wire. The coils are then inserted into the stator and connected as per data previously recorded. The lead wire used is Sil-a-blend, Hypalon, or EPDM all rated at 600 volts. New windings are surge tested for grounds, shorts, or faulty connections. They are then voltage tested for even phase amperage draw. The stator is next dipped into varnish, removed, and baked. This process is repeated several times to achieve thicker insulation. The stators are then cleaned and prepared for assembly.The motors are assembled using high quality ball bearings (e.g. SKF, Fafnir, FAG, or NTN). Bearings are heated to 225° F in an oven, which allows them to slip on easily avoiding damage to the shaft or bearing. The housing or bearing is packed with Chevron SRI grease. The assembled motors are then megged and test run at full voltage. The completed motor is painted gray or a requested color.